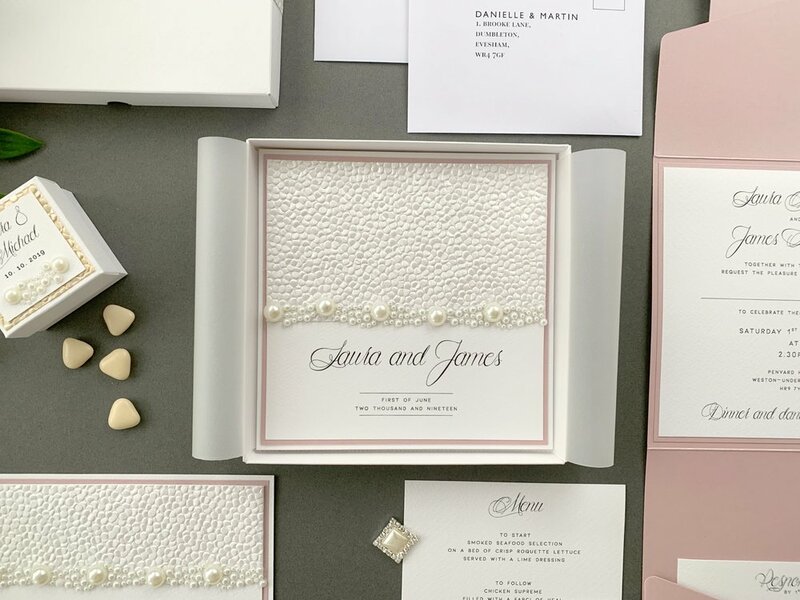 We think this design works beautifully in a muted, complimentary scheme as pictured - but with a choice of pebble paper colour and the option to upgrade pocketfolds and base layers to a coloured variation, a bolder, more striking scheme is achievable with this wedding invitation design. Calypso is provided as standard with a white base layer, for the folded day invitation, flat evening invitation, or pocketfold invitation. The “matting” is coloured as standard, which is the layer that sits between the base and the top. The example shown here is using “Antique Pink”. Calypso uses gorgeous and tactile pebble paper which is available in a number of different shades to either blend or contrast with your other colour choices, the pictured examples use “White”. Click below to see the options are available.